Corn Muffins contain a healthy source of whole grains and nutrients that carry significant health benefits, which make it a preferred choice. There are few foods that can be considered as quintessential to the summer months as freshly picked corn on the cob. Corn is seen in food products everywhere including whole corn, corn tortillas, corn meal, corn flour, cornstarch, corn syrup, corn oil, popcorn, corn chips, corn muffins and bread, polenta, and grits. In fact, corn is also considered a whole grain food source, but seldom considered as a unique supply of nutrients and health benefits. It is possible that you have strolled by a tray of corn muffins at the market and thought to yourself that it was an unhealthy choice. The word “muffin” alone helps qualify the item as a baked good, and therefore associated with sugar and fat. A simple analysis of the ingredients will clear the air for the beloved corn muffin. The most imperative ingredient in a corn muffin is ground cornmeal. This is the component that gives corn muffins their classic corn flavor. Along with corn meal, corn flour and corn grits are all types of ground corn, but differ by their particle size. Each can be found as either whole grain or degerminated. Make sure to check the label for whole grain, as it contains the entire grain seed with all nutrients intact. If the label reads ‘degerminated corn’, the nutritious germ has been removed from the corn. Yellow corn meal is the only whole grain to contain beta-carotene, a nutrient that is processed into vitamin A in the body. Vitamin A is essential for eye and immune health. There is consistent evidence from research that whole grain foods significantly lower the risk of chronic conditions such as coronary artery disease, diabetes, and cancer. These studies also exhibit a role for whole grains in the management of body weight and digestive health. 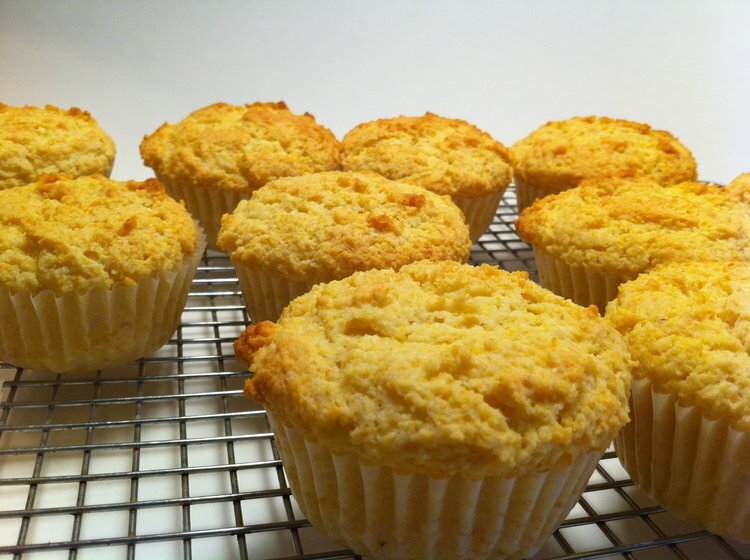 By choosing cornbread muffins made with whole grain cornmeal, you are choosing a healthy, nutrient rich grain product. But it is important to also weigh in the other ingredients used in the recipe. Typical ingredients used to make corn muffins and breads, in addition to cornmeal, include flour, baking powder, sugar, salt, eggs, milk, and vegetable oil. Regular flour should be substituted with whole-wheat flour. Also, aim for corn muffin recipes that contain 2 tablespoons of sugar or less. Next time you ponder at the baking aisle in the market, or consider baking muffins for the family, consider corn muffins as a healthy alternative to other baked goods. Their healthy source of whole grains and nutrients that carry significant health benefits make it a preferred choice. When you do not have to sacrifice taste for healthy whole grain options, like healthy cornbread muffins, there is no reason not to add them to your breakfast or dinner menu. Soong, Y. Y., Tan, S. P., Leong, L. P., & Henry, J. K. (2014). Total antioxidant capacity and starch digestibility of muffins baked with rice, wheat, oat, corn and barley flour. Food chemistry, 164, 462-469. Soong, Y. Y., Quek, R. Y. C., & Henry, C. J. (2015). Glycemic potency of muffins made with wheat, rice, corn, oat and barley flours: a comparative study between in vivo and in vitro. European journal of nutrition, 54(8), 1281-1285. Hollingsworth, B. A. (2007). Effects of ground chickpea as wheat flour replacer in corn muffins. Individual Project Written Raport. F&N, 453, 1-11.